Well, what a difference a week makes! Fine warm weather has finally arrived and with the forecast southerly winds, migrants have been arriving in large numbers. Spring is here at last. This week has really seen the migrant floodgates open up. Wednesday in particular saw a large increase in migrants such as willow warbler, chiffchaff, blackcap and sedge warbler. Reed warblers are also just starting to increase and at least six grasshopper warblers appeared overnight. Also present on Wednesday was a yellow wagtail, white wagtail, lesser whitethroat and a passage of swallows. 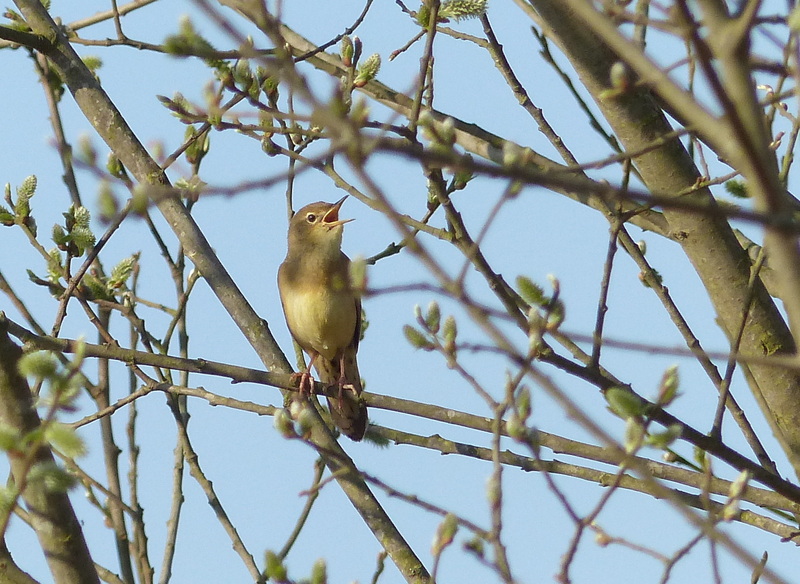 A savi’s warbler was reported on Monday, but remains unconfirmed. Two cranes were also seen over the fen on Monday. Kingfishers are still present, but busy nesting so not giving very good views as they are currently preoccupied! Marsh harriers however are certainly putting on a good show at the moment, with up to 10 being seen over the fen daily. At least one bittern is booming, I still have not had any reports of two booming simultaneously yet, but if you do, please tell the reception volunteer. The bitterns are also being seen in flight over the fen on quite regular occasions. The wet grassland at Buckenham has become a noisy affair, with lapwings, redshanks, oystercatchers, snipe and avocets all loudly proclaiming territories and seeing of any predators that come too close. A pair of garganey are also still present from the hide at Buckenham. On Monday early morning a spoonbill headed over Buckenham travelling east at height, interestingly it was seen at Breydon Water around 40 minutes after my observation so it was clearly on the move. Insects are beginning to emerge in numbers and the current warm weather should certainly encourage more out by the end of the week. On the butterfly front, we currently have brimstone, peacock, red admiral and peacock out in good numbers with the first holly blue of the season on Wednesday. I would expect the first orange-tips to be found before the end of the weekend. I would also expect the first large red damselflies and hairy dragonflies to be seen very soon if this weather keeps up. The vegetation is also gaining height and many of the early flowering plants are enjoying the sunshine. We nearly have a full complement of migrant birds at the fen, we are still awaiting cuckoo, garden warbler, hobby and swift, these may all be here sooner than expected if these southerly winds continue. The trails are also drying out nicely thanks to the warm and windy conditions, it is now possible to get all the way around the fen trail with walking boots (!) although there are a few muddy patches to watch out for.